Georgia Easteal is currently working as a Re-Housing Administrator at Brighton & Hove City Council and she is doing a Level 3 Digital Business apprenticeship along side. After Georgia left school when she was 16 she knew that college was not the path for her. She decided to look into other options that would help her get on the road to a new career. 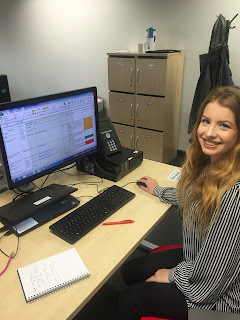 After looking around at her options and several interviews, Georgia decided to apply for an apprenticeship at Brighton & Hove City Council as a Level 2 Business Administration apprentice in the Transport Projects team. Here she learnt the essential administration and office skills that would assist her in any future job role. Furthermore she got the chance to work on major projects within the city, such as the Brighton & Hove Bike Share, which broadened her knowledge on how projects are managed. As well as these skills she also built up key relationships with colleagues in the organisation. Whilst doing her apprenticeship Georgia became an apprentice ambassador. This involved visiting schools and going to events where she would promote apprenticeships not only within the council but also across Brighton & Hove. After Georgia completed her apprenticeship she decided she liked working with the council and so wanted to stay. A job opened up in the Post 16 Development Team for a Level 3 Digital Business apprentice. As she had enjoyed her role as an apprentice ambassador Georgia went for the job and got it. Her new apprenticeship involved visiting schools just like the ambassadors did but she now also got to set up her own events, including a speed dating event where local employers met young people interested in doing apprenticeships and they could do practice interviews and the young people had the opportunity to give their CVs to the employers. As Georgia was still doing her level 3 apprenticeship she saw that a vacancy had become available in the Housing Team at the council. Georgia had been interested in working in this department for a while but thought she would only look into it after her apprenticeship was over. However, she decided to apply for this job just to see if they were interested and to get some interview practice in case she did want to apply for a job in housing at a later time. At the interview she explained how she was doing her apprenticeship and would like to continue doing this if they did accept her for the role. A few weeks later Georgia heard back from the interviewees and they wanted to hire her! They had been impressed with the experience she had gained during her apprenticeships and wanted her to join the team. Even though Georgia would need day release every so often for her college course they were happy to take her on as a full time employee. “My journey as an apprentice has really helped me get my foot in the door.